It’s very nice of you to say you think my articles are well-written, and that you feel the author knows the subject matter very well. It’s lovely that you’ve so carefully considered the relevance of my website to yours, and decided to enrich my website with a link to your own. Be that as it may, the utter generalisation of your statements, combined with the fact that both your home URL and your name appear to be “best payday loans”, it’s kind of obvious your entire reason for visiting my blog is to attempt to spam it. Just FYI, it takes me far less time to mark your comment as spam than it does for you to copy/paste your tripe to the comment box and solve the captcha puzzle and post your comments to my moderation queue. Please re-evaluate the return on your investment here, and kindly go away now. 99% of the time, I hate living in a world where society is basically one giant ongoing parody of itself, but this is one of the funniest things I’ve ever seen in my life. 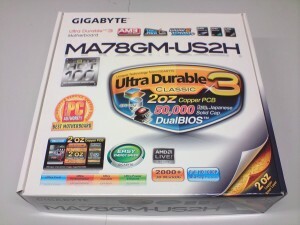 We just got two of these in at work today, and both went into new PCs. Both had the same graphics glitch: Some violent-looking video flicker the whole way through Windows XP setup, which calmed down a bit once the drivers were installed but then had a weird row of green boxes flickering across the top of the screen. The guys in this forum thread suggested turning Cool’n’Quiet off in BIOS; that made no difference to me, but updating the BIOS fixed it for everyone. I went from version F2 to F5; it seems to be fixed in F3 and up. Go here and scroll down to get the latest BIOS update. Our two boards were revision 1.0. There’s also apparently a v2.0 of this board with a slightly different chipset (SB710 instead of 700). I don’t know if it’s affected or not. I’m surprised this made it through quality control; it’s an obvious problem and all you need to see it is to try installing XP. It happens on both CRT and LCD monitors. It’s easily fixed though – you just put the new BIOS image on a FAT32-formatted drive (a USB flash drive will do) and hit F8 from within BIOS to get to Q-Flash (or the End key from the POST screen). This is increasingly becoming a common situation: You’ve got a brand new laptop, it’s got Vista, it runs like a dog, and you want XP on it instead. You’ve got a spare copy of XP – for one reason or another – and you’d like to install it. Here’s the catch: Tons of new hardware is being brought out without drivers being written for Windows XP, and laptops are just full of it. Case in point: an HP dv6836TX, which a customer recently brought in to have XP loaded on it. HP do not provide XP drivers for all of its hardware, only some of it, and it took me a good half a day to find everything. Software for the card reader – a Ricoh R5C822 – came from a similarly-specced Dell Inspiron 1525. The onboard LAN pretended to be a Realtek 8139, which XP has drivers for, but those drivers actually hung the system; it’s actually an RTL8102E, or something like that. The simplest way to identify hardware in a computer is to run a program that looks at all the individual devices, matches them up to a big list of vendor and device IDs, and tells you who made each thing and roughly what it’s supposed to do. 99% of the time at work, we use Everest for that, which isn’t a free program but the trial version is perfectly capable of IDing hardware. The graphics gave me the biggest headache by a long shot. NVidia do host drivers for laptop chipsets now, but because HP (and practically every other laptop maker…) subtlely customise their hardware, NV’s software for the 8400M GS failed to see any compatible hardware, and flat refused to install. It’s the most frustrating kind of incompatibility: it comes down to one little text file missing one little line with some numbers in it, the result of which is that you’re completely dependent on your computer manufacturer for software updates. Or, to put it another way: You’re not. I mention laptopvideo2go.com in passing on my driver guide, but today they deserve some serious recognition. These guys collect those little lines from all the laptops they and their friends can find, and put them all in one big text file – the .inf file, which lists all the hardware a driver is compatible with – so that NVidia’s own drivers will recognise NVidia’s own hardware. It’s a bit tricky to do – their site is a little confusing in places, and financially supported by well-placed driver-promising ads where necessary – but their forum is run by human beings, and anybody even slightly technically minded ought to be able to figure it out. I managed to, and that 6836TX went home running XP like a champ. You’ve all heard of it. Some of you even know what it looks like. But who’s actually used the Opera browser? I’ve tried, a couple of times. My opinion’s always been “holy crap it’s fast”, “holy crap it’s configurable”, “can’t be bothered switching to it because Firefox has Adblock Plus and Net Usage and I couldn’t find equivalent plugins that were as simple and obvious to use”. Here’s an interesting article – “8 Browser Innovations Started by Opera“. Apparently we’ve had tabbed browsing since the year 2000, but nobody noticed. I suppose it would’ve been irrelevant until the majority of people had dialup and could stand to load more than one page at once. That article makes an interesting point about market share. Obviously Internet Explorer is largely popular in graphs because it’s the first program tons of new computer users actually see (and trying to conceptually separate Internet Explorer from “my Bigpond Explorer”, “my email”, and “Windows” can be hilariously difficult), but I’ve played with IE8 on the few occasions I’ve actually sat down to use it, and it’s actually not terrible. 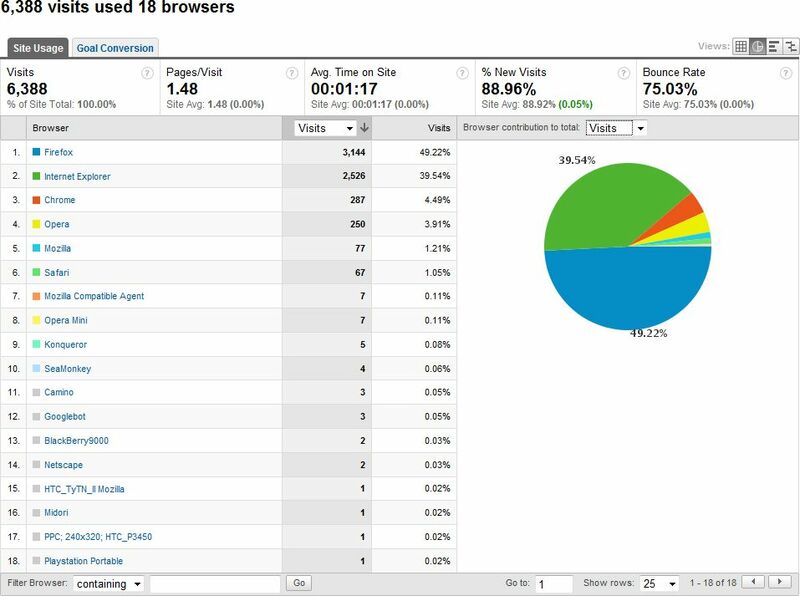 Here’s the breakdown of web browsers used by every visitor to a page on tim.id.au/blog in the last 90-odd days. You’d expect a huge amount of IE users (drivers are usually the first thing to go on a freshly installed PC), but Firefox reigns supreme. Chrome is more popular than Opera, and there’s some Safari in there too. The Opera Mini hits are concievably all my own fault – I use that on my phone, having never bothered with Sony Ericsson’s default K850i browser. I’d never heard of Camino before looking at this myself (hello, Mac users! What are you doing here? *waves*). The rest are weird little devices, probably random hits from bored friends of mine. Who I could probably identify from those devices. You guys are bored. Operating systems. Windows takes a good 7/8ths of the cake, while Linux makes up most of the rest (Hi to anybody who set up their own Ubuntu DHCP servers or whatever from my walkthrough!). 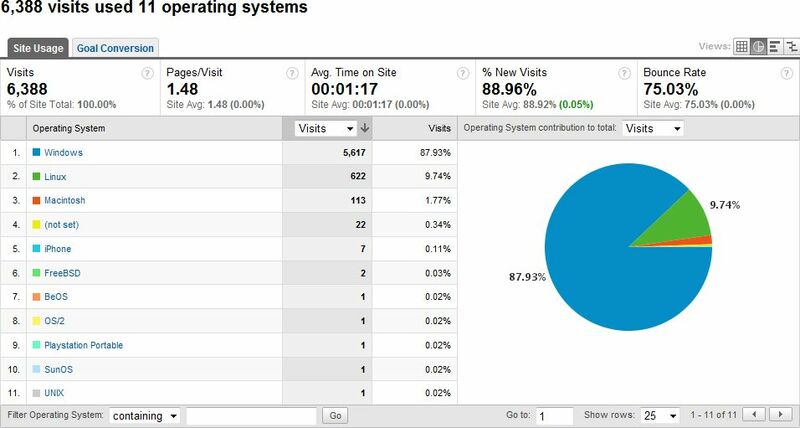 A small number of iPhone OS hits (Hi Nathan and Bohdan! ), SunOS and UNIX are probably from universities, and surely whoever’s responsible for the OS/2 hit is taking the piss. These files contain parts lists for each model, and how to disassemble them, down to the LCD screen and the motherboard. As a repair aid, they are invaluable, as they can easily halve the time it takes to replace a keyboard, and attempting a motherboard swap without one is a risky, unreliable procedure. The manuals are often difficult to find, though; very few manufacturers actually publish them for the general public, and I strongly applaud and recommend those that do. Those that don’t, on the other hand, only make it more difficult to repair their laptop computers, which reflects badly on them as companies who care more about their sales than their support. I invite everybody to have a look, email people the link, digg it, tweet it, whatever. The more people who see it and know it exists, the more will (hopefully) help me expand and improve it over time. This has been bugging me forever. I pay Exetel for my mobile service, and have never managed to get MMSes to work. Sending or receiving. Vodafone (who Exetel resell) have a page that sends their MMS/GPRS/etc settings to your phone. I’d tried this a few times, and while the settings for net browsing worked fine, nothing I did ever made MMS work. I finally got around to looking for a solid fix for this, and found a post on Exetel’s forums suggesting I go to my phone manufacturer’s support site, and get them to send me MMS settings. I have no idea why this should work – Sony-Ericsson are many many steps more removed from my problem than Vodafone is – but it did work. Apparently S-E’s Vodafone settings work, while Vodafone’s Vodafone settings don’t. Go on, try it. It worked for my K850i, it worked for that guy’s Motorola. You think BIOS beep codes are hell? Try understanding the incomprehensibly wide array of settings required to make a mobile phone talk properly to its network. I hate phones. A frequent question at work is whether or not you should turn your computer off at night. The answer is pretty simple: leave it on if you’re coming back to do something later, and leave it off overnight unless you’re downloading something. Not many people realise that their monitors also drain lots of power – large LCDs are often no better than the CRTs we used to lug around – and they still chew current in standby mode. One recent customer, though, was more worried about something… else. Customer: Should I turn my monitor off at night? Does it do any damage leaving it on? Coworker: It’ll still use a bit of power in standby mode, but it won’t damage anything to leave it on, no. Customer: Oh… won’t that little orange light wear out though?